It was this question I sought to answer when I started hacking away at SQLCLR functions. As you read the following, please don’t laugh too hard at me (a small snigger will suffice) – it has been a long time since I hacked away at code. Google has published a very interesting hash function, MurmurHash, claiming to have the properties I am looking for: It is both fast and has a good spread. The hash algorithm comes in different flavours: MurmurHash2 and MurmurHash3. Each flavour also exists in architecture and word size optimized versions. I decided to implement the x86/x64, 32-bit integer version in C#. Fortunately, someone already beat me to it. Davy Landman has an implementation of MurmurHash2 – which he has kindly shared under GPL. I took his implementation and wrapped it in a SQLCLR user defined function. While trying to understand Davy’s code and hacking it to work with SQLCLR, I had a few “aha moments” that I would like to share. 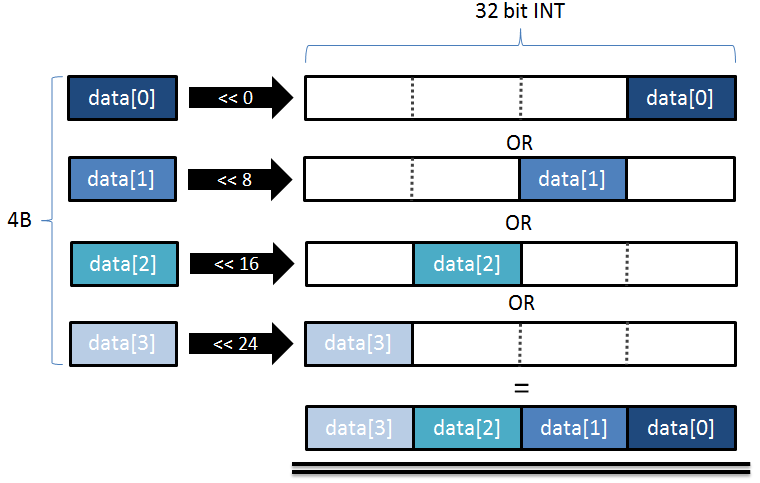 Please note that left shift (<<) and or (|) operators take INT32, not UINT32 as input. Hence the need to cast the final value to UINT32. I need to get form the UINT which is returned by the reference implementation of MurmurHash to the signed integer (SqlInt32) that SQL Server understands. Doing the unchecked cast here is faster than Convert.ToInt32. From the C++ source code of MurmurHash3, and using Davy’s bit trick, it took me only a few hours to get myself a nice implementation of MurmurHash3. I compared this with a C++ implementation done by my colleague Christian Martinez (based directly on the Google source), and we agreed on outputs that exercise all the branches in the code. So I am reasonably confident that my implementation is correct. The source code for the MurmurHash functions is too long to paste in this blog, so I created a new page on my site which you can find by following this link: C# Source code for MurmurHash in SQLCLR. Before I show you the spread and speed results, let me just talk a little about two very old, but very commonly used, hash functions. 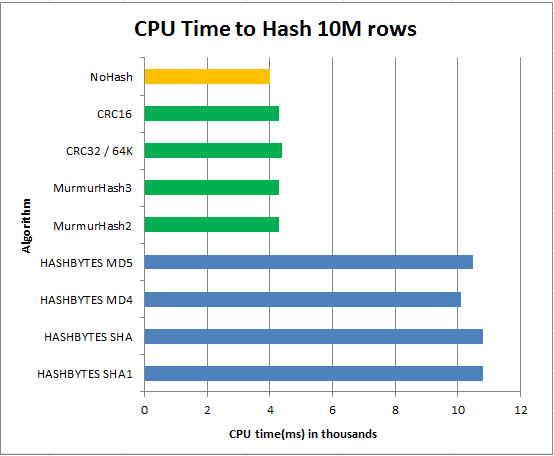 The Cyclic Redundancy Check (CRC) family of hashes are, compared to MurmurHash, very simple to implement. They walk through each byte in the input and divide it with a specially selected polynomial. For implementation purposes, the polynomial is simply a constant in the code and the division is done with XOR and shifting (making this a very efficient operation). The remainder of the byte division is fed into the division on the next byte (giving the hash algorithm its name) and so on, until the end of the input . WikiPedia contains a great reference implementation that I used for my tests. For readability, the source code is again available on a separate page of this blog: CRC16 and CRC32 in C#. At this point, you may wonder if I did all of this to give you a chance to laugh at my rusty coding skills. What exactly was the point of implementing a new hash function in the first place? Isn’t that beautiful? If we don’t need the cryptographic properties of the HASHBYTES functions, we can beat SQL Servers hashes with our own SQLCLR implementation. Please note that I took out MD2 from the above to avoid skewing the results (I have previously shown that it is simply too inefficient). Notice that even such a simple user defined function that does nothing, consumes almost all the same number of CPU cycles as a full hash calculation. This is the overhead of the CLR and throwing data back and forth between managed and unmanaged code. So much for my optimizations in CRC. Now THAT is pretty nice isn’t it? We see that good old CRC makes for an excellent hash function for our purpose. 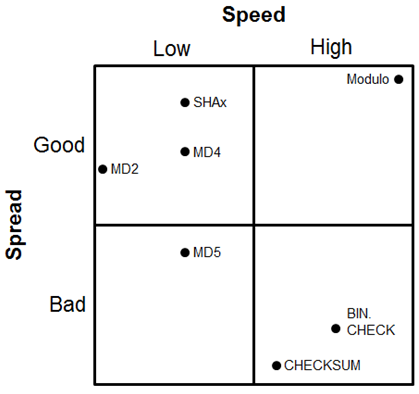 MurmurHash does very well too, comparable with SHA, but at under half the CPU cost. In this blog, I have shown you how to implement hash functions that are both faster and have better spread than the built in hash functions exposed in SQL Server HASHBYTES. We have also seen that the overhead of SQLCLR is significant for this case, and hence, it would be preferable if non cryptographic hash function were exposed natively in SQL Server. I owe Christian Martinez thanks for this blog for directing me to the MurmurHash functions, and for helping me validate the correctness of my C# implementation against his C++ version. PS: As I was exploring this little implementation, I noticed that one of my heroes, Donald Knuth, has extended The Art of Computer Programming with a new volume: Volume 4, Fascicle 1: Bitwise Tricks & Techniques; Binary Decision Diagrams. That sounds like an interesting read and it is now on my birthday wish list.